Here are some interesting Operating system and softwares tips and tricks 4u.JUST CLICK ON THE PICTURE IN THE BLOG FOR ENALARGED VIEW. 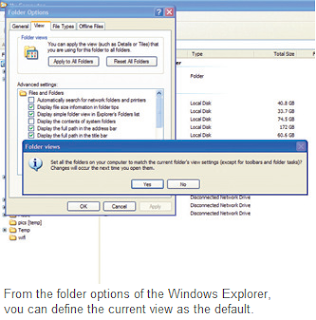 Objects in folders in Windows Explorer are usually displayed as large symbols. Although this looks great, it is very chaotic and does not give any information. You cannot see anything apart from the fifile name. And setting all folders to the detail view is annoying. Defining the detail view as the system default. For that, open Windows Explorer with [Win]+[E] and activate the desired viewing mode from ‘View | Details’. In Windows Vista, you must first unhide the Windows Explorer’s menu bar with [Alt]. This limitation of Vista is also applicable for all following menu commands. Then open ‘Tools | Folder Options’. Click on the dialog of the same name on the ‘View’ tab under ‘Folder Views’ on ‘Apply to all Folders’ or ‘Apply to this folder’. Confirm the following query by the operating system ‘Set all folders on your computer to match the current folder’s view settings’ with ‘Yes’. Close the ‘Folder options’ dialog by clicking on ‘OK’. Windows now changes the view of all folders of the current type as per the instructions in the directory.